I am an amazing judge of character. Call me an aura savant, if you will 😘. 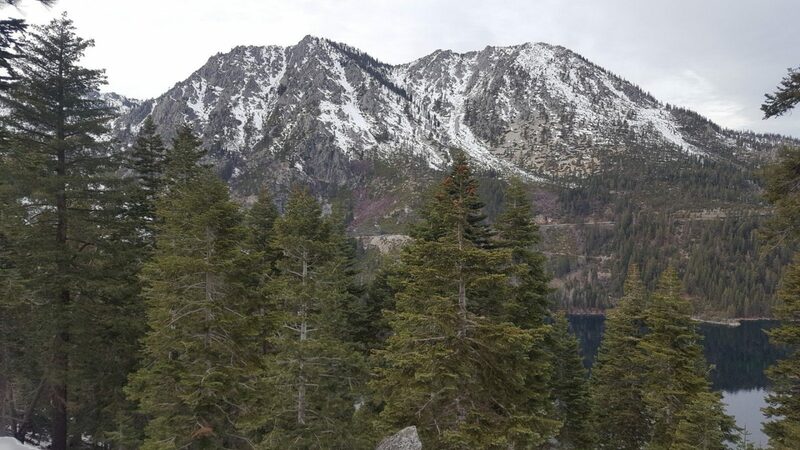 I have been traveling north to South Lake Tahoe for the past 8 years (Once for my birthday in the spring and 3 consecutive winters in a row) staying only at the Beach Retreat and Lodge for my vacations here in this beautiful little mountain town. I grew up in the mountains of Rockland County New York and have traveled to Switzerland and stayed among the peaks of Leysin but there is something magical that this quiet little mountain town does to me. 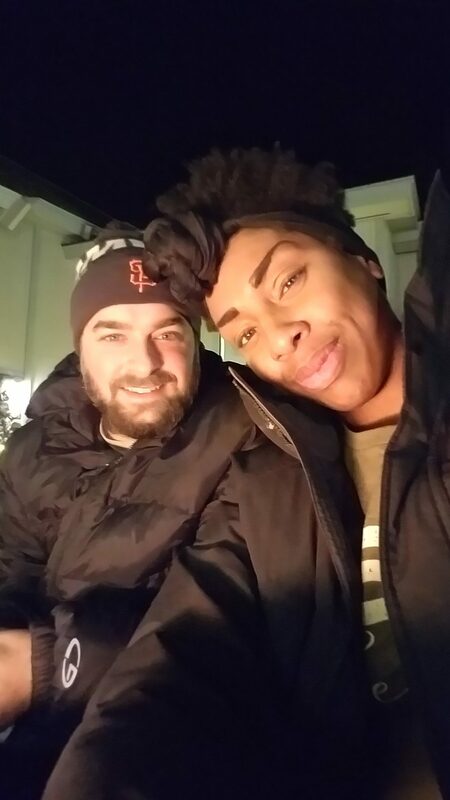 The passion of the staff is infectious in the best was possible and I would like to share with you my top 10 reasons to Visit South Lake Tahoe in the Winter and stay at the Beach Retreat and Lodge! 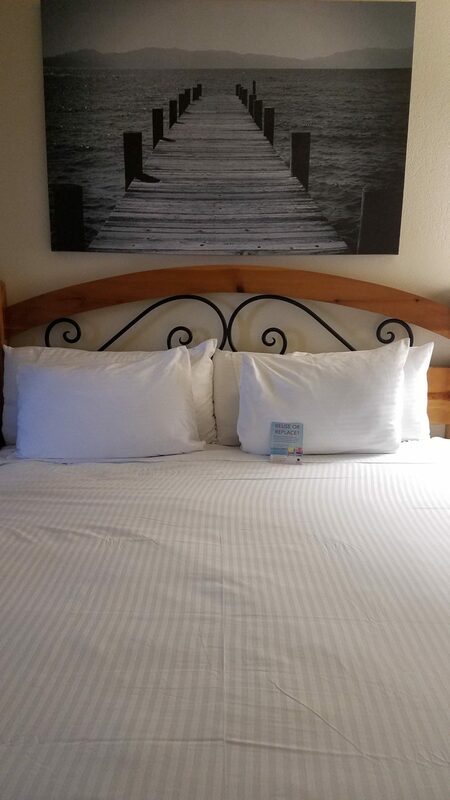 Special thank you to Beach Retreat and Lodge for sponsoring a night in exchange for a blog post! The first time that I ever came to the Beach Retreat and Lodge was way before kids and during the springtime. 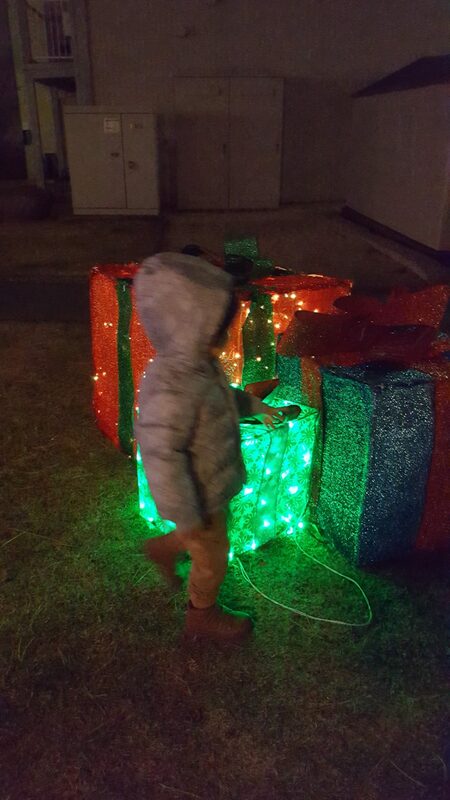 We started coming here every winter after I had my son Keian and we are never disappointed with our stay. 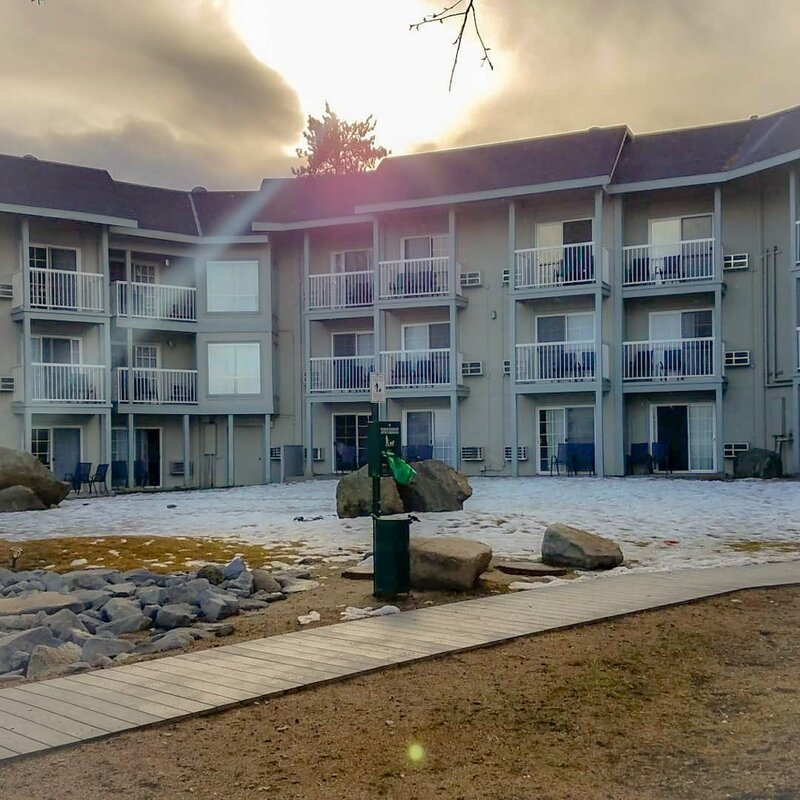 Beautiful capture of the back of the lodge! 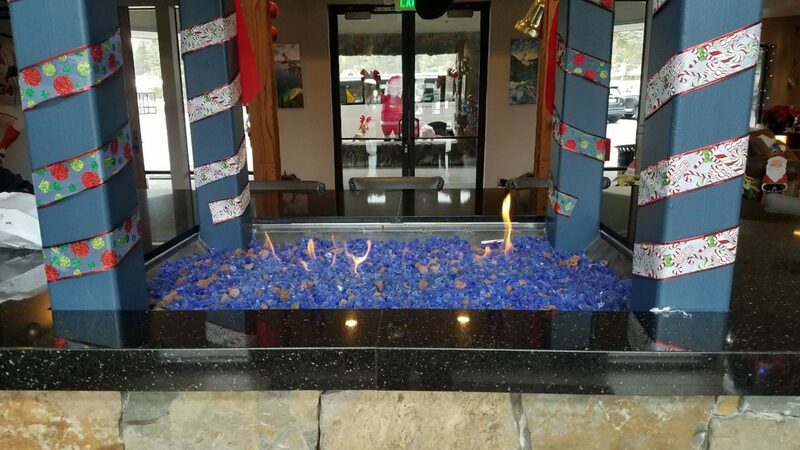 Cozy up by the fire in the lobby as you wait to check in! Each room is equipped with an air conditioner as well as a fireplace! 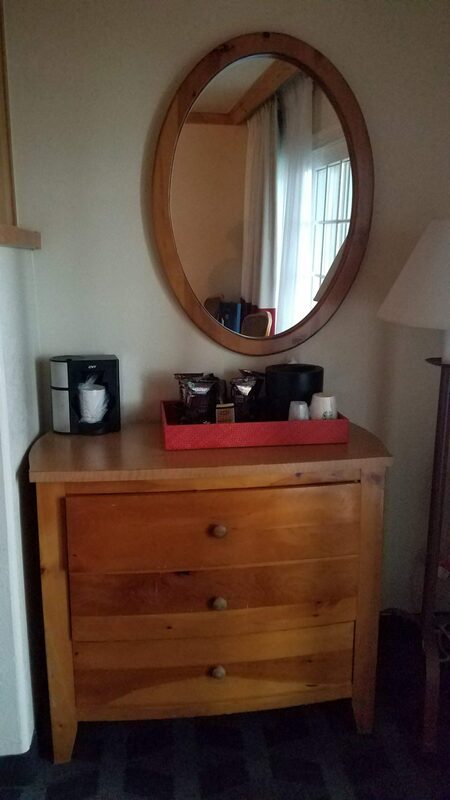 There is a coffee maker for you to enjoy delicious Starbucks and plenty of amenities throughout the room. 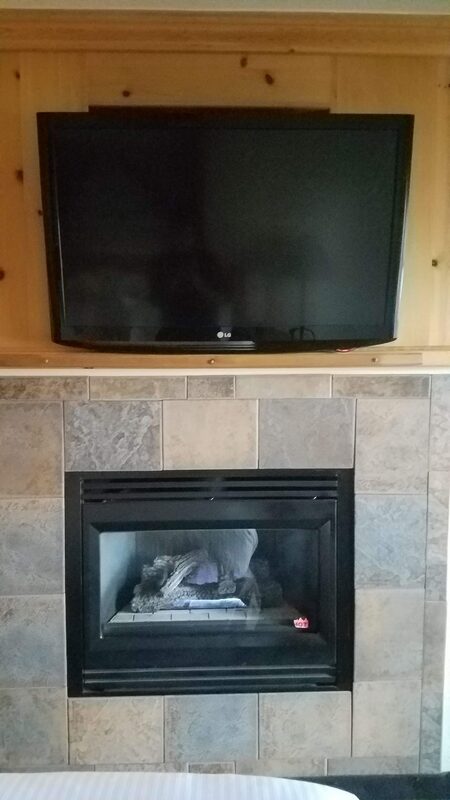 Fireplace and tv with free wifi for late night binge watching! I have to admit, my favorite part of the stay is the fireplace. It keeps the room nice and toasty while keeping the spirit of Christmas alive! Each room is designed with a gorgeous beach and boat theme as they sit right on the lake. They are beyond reasonably priced, family oriented and a pet friendly hotel so you don’t have to board your animals for the holidays! Ahhhhh……the play on the name gets me every damn time. 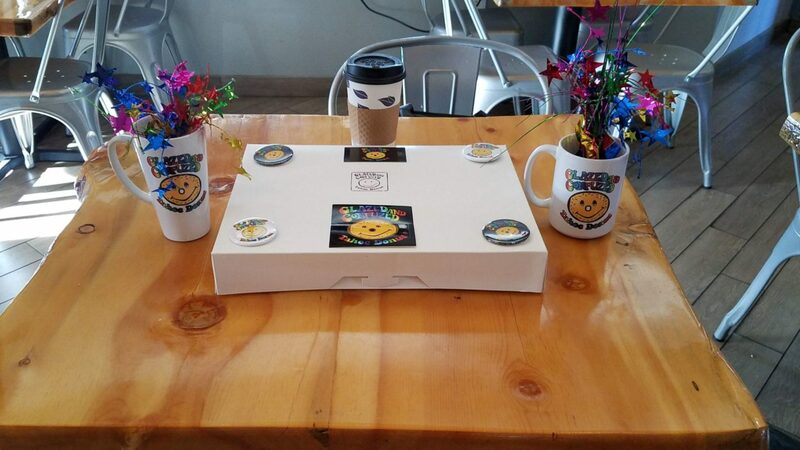 Dazed and Confused was one of my favorite movies to watch growing and these donuts by Glazed and Confused that ploy on the name live up to the title! The owner Marra is the sweetest and most souful owner I have ever met. 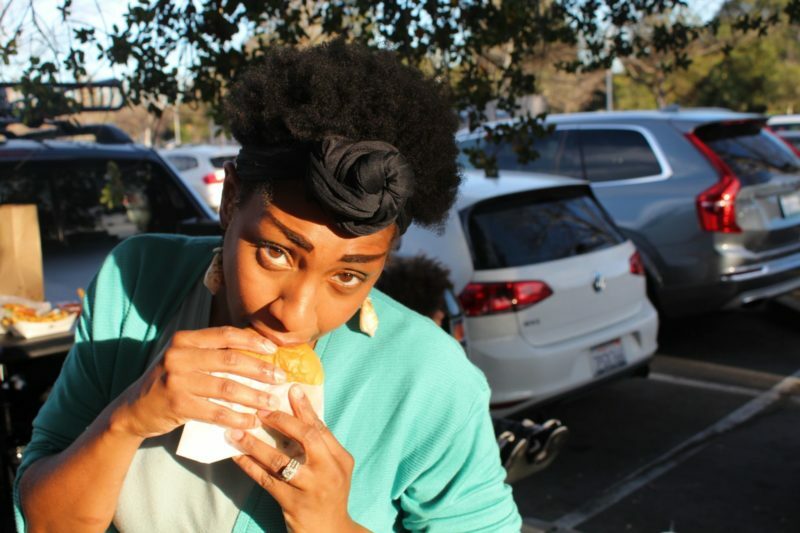 She has the most delicious donuts such as a chocolate bacon bar, a maple bacon bar, cookie monster, and a butterfinger donut as well!! 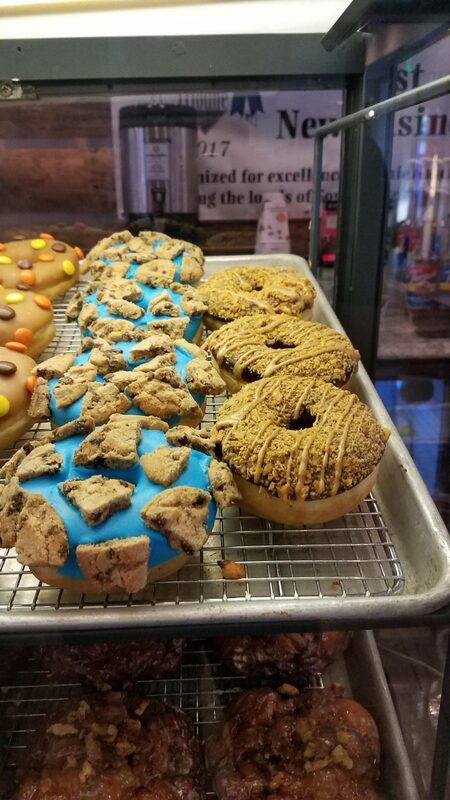 See that butterfinger donut on the right? MY ABSOLUTE FAVE! They serve breakfast sandwiches along with a fine selection of coffee, tea and delicious syrups for both! Make sure you stop in and get your fix after check in! 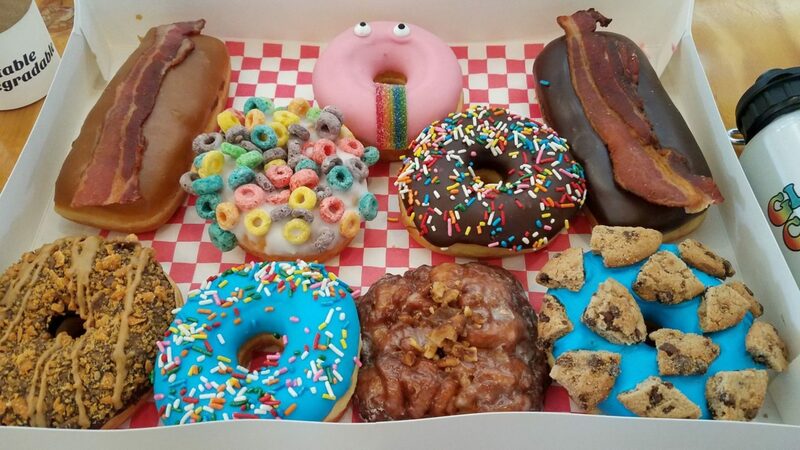 Shown are the maple bacon bar, The John Ritter Apple Fritter, Cookie Monster, Floyd the Donut, butterfinger donut, glazed with fruit loops and the traditional chocolate with sprinkles!!! 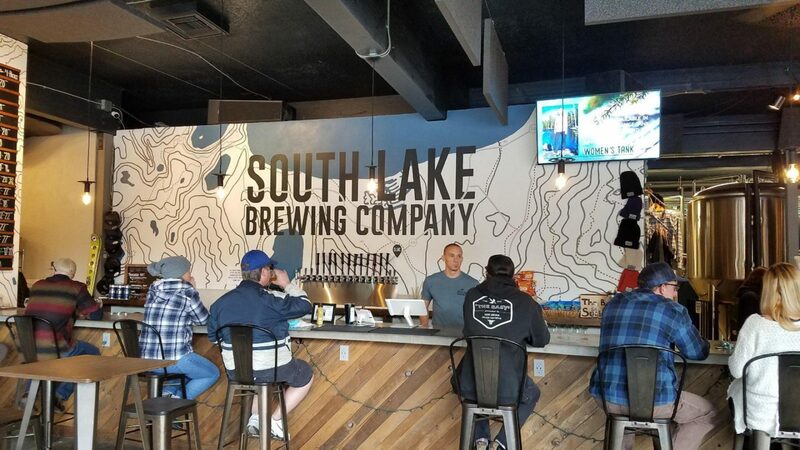 They are opening a second location and going to have their own brick and mortar hopefully this month! 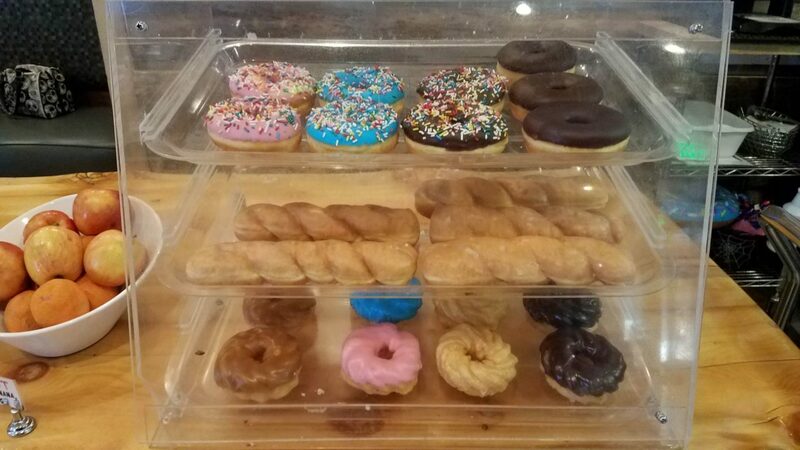 Stop by and visit after you check in for some delicious donuts that you dont wanna miss! Look at all of the amazing events they have available!!! 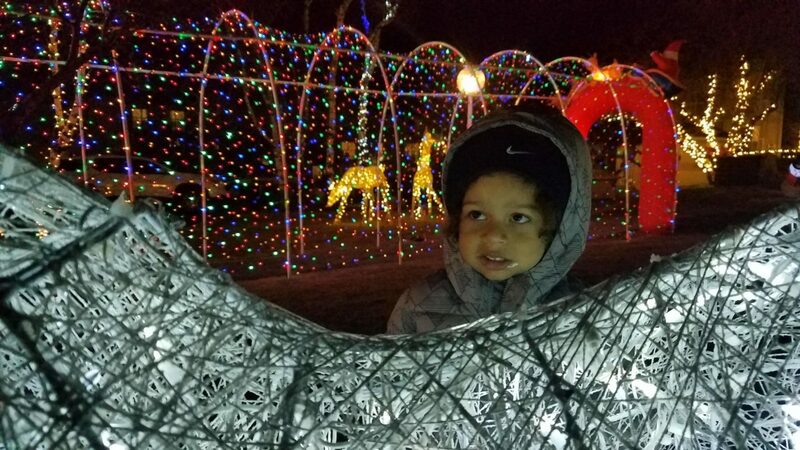 During the Christmas Holidays, the entire Beach Retreat and Lodge is turned into a Winter Wonderland full of visual treats for everyone to see! 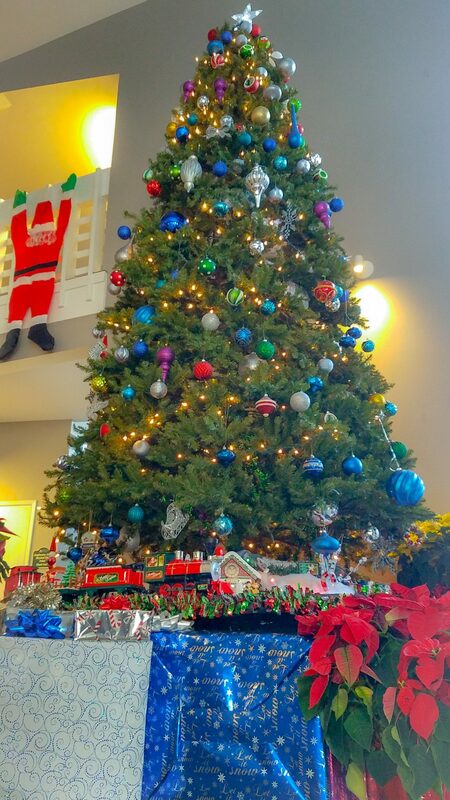 They have an amazingly beautiful tree that is centered in the lobby that has its own fully functioning running train! The entire lobby is decorated from head to toe so you get a full on Christmas Experience. 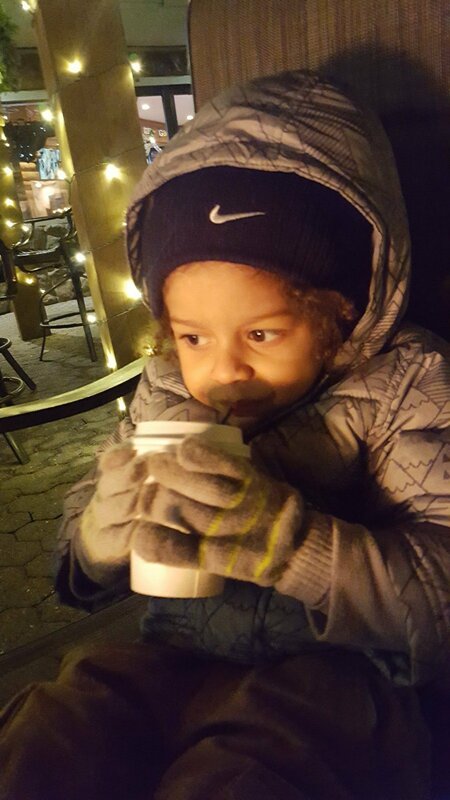 There is plenty of hot chocolate with marshmellows too that you can enjoys with your little ones!! 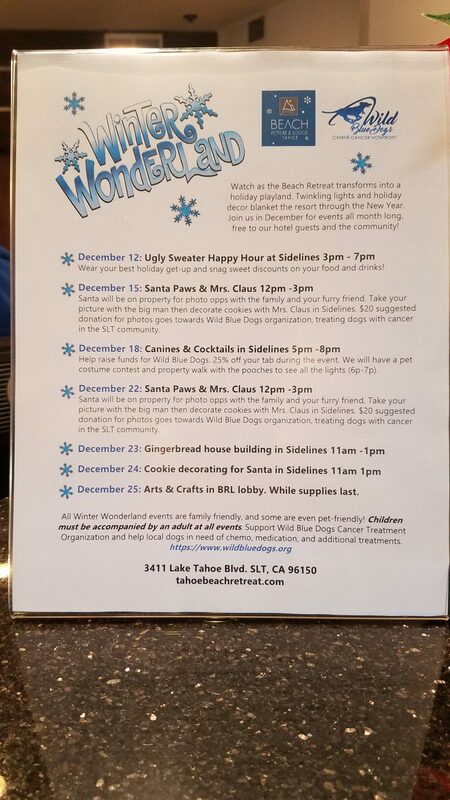 When you do visit in the winter you can attend all the wonderful events that they have such as Santa Paws!! 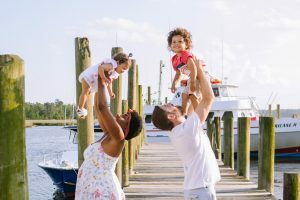 You can bring your pup with you and get family photos taken! 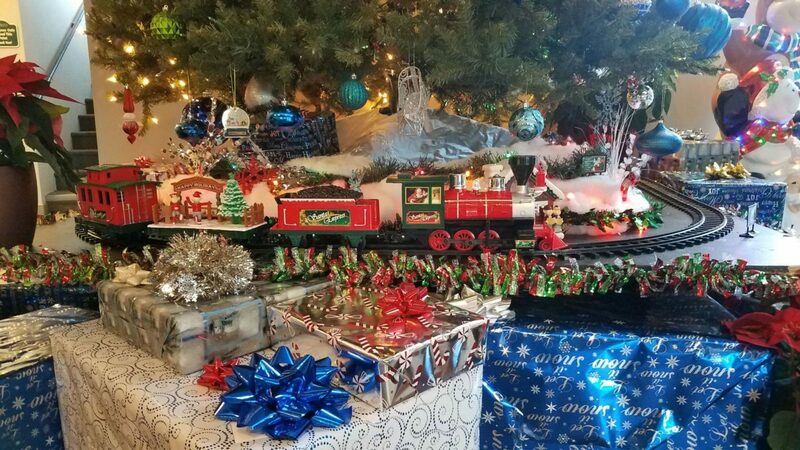 Every year the place is decorate to the max by the amazing Rebecca who runs this hotel like its no ones business. 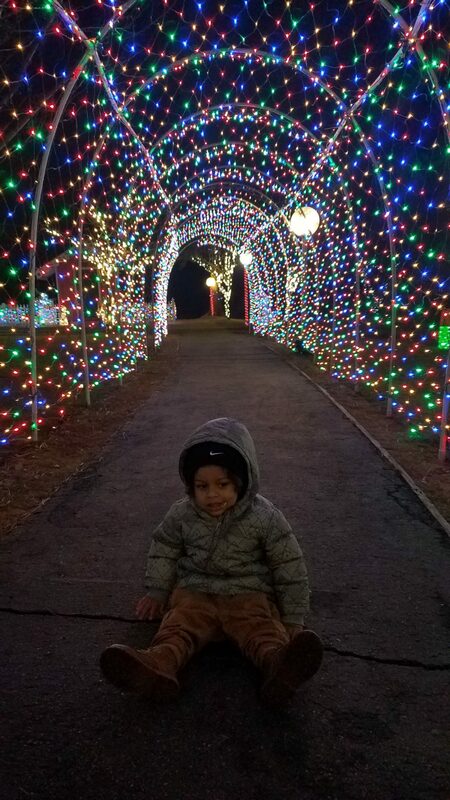 My son was beyond excited tp sit and pose with the tunnel adorned with string lights! 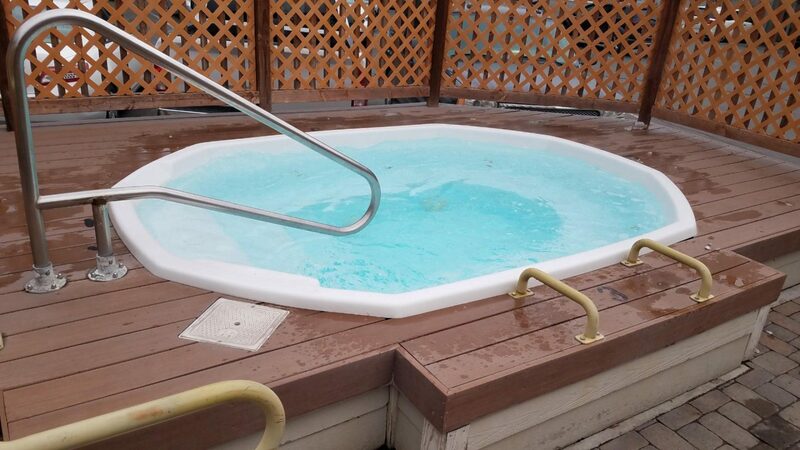 This year the pool and the hot tub were open all winter long if you want to take a dip! Here are some photos of the property! 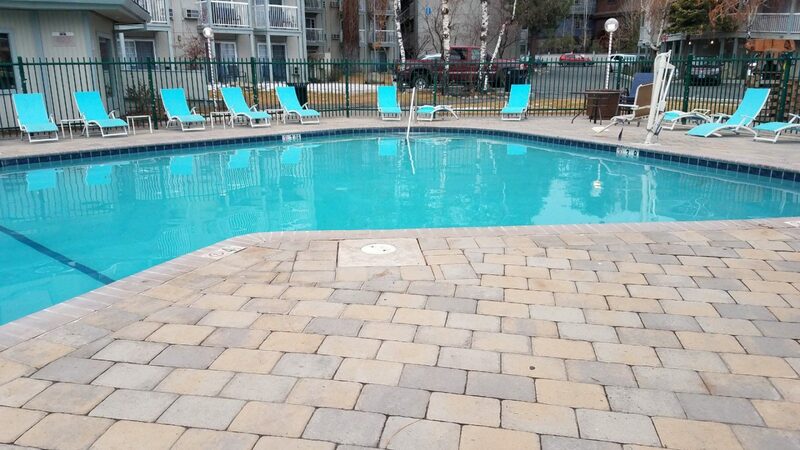 If you wanna brave the weather, do a polar plunge into the heated pool! Hot tub is ready for action folks! Ahhhhhh sledding the day away is much fun when there is plenty of snow to go around! Lucky for you about 10-15 minutes uphill from The Beach Retreat are some epic hills that you can heck out to sled on with the family. 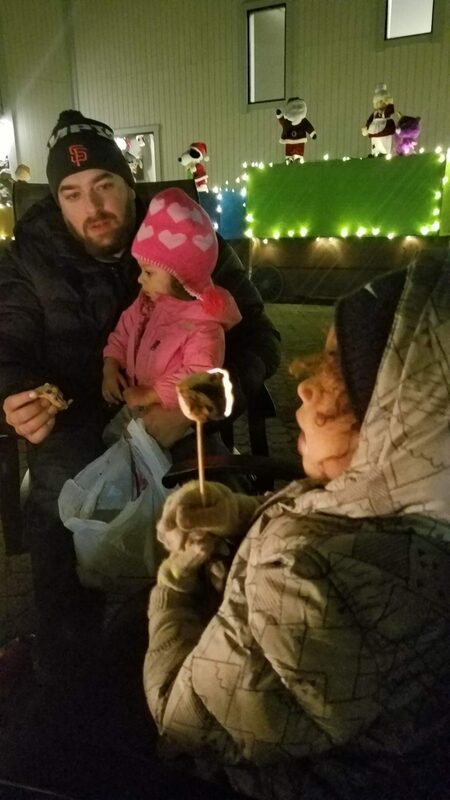 We brought the entire family with us that day (including the dog) and had an amazing time showing the kids my favorite winter pastime! Mama successfully did not end up in slamming into a tree!!! My boys at the bottom of the hill!! 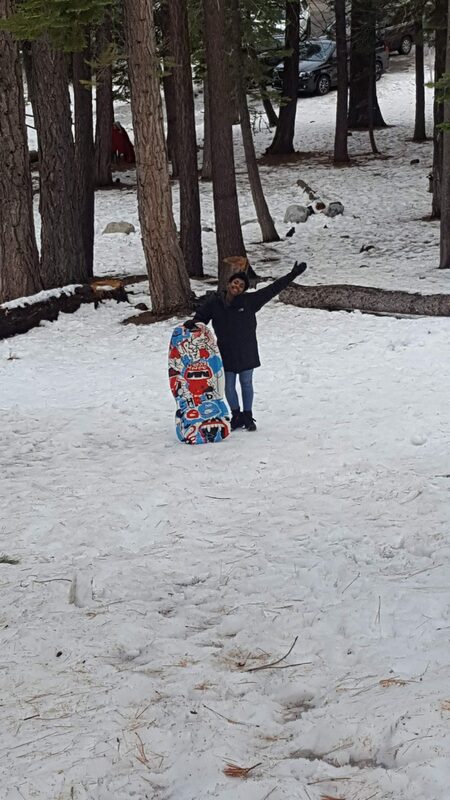 Sledding is soooo much dang fun! 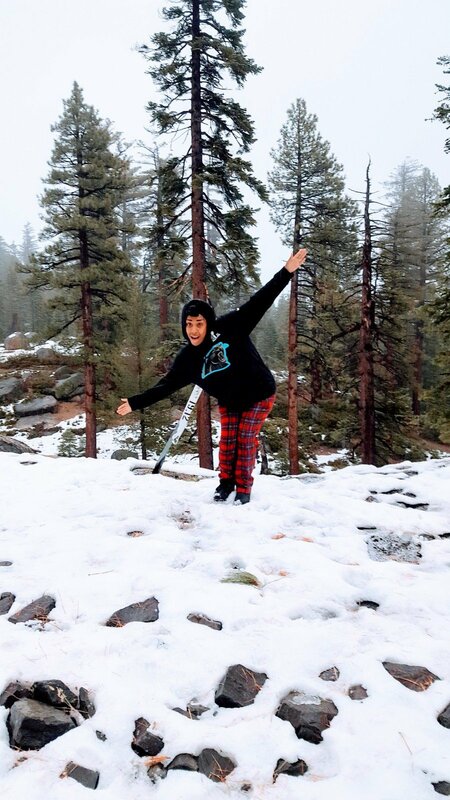 There is an incredible Vista Point across the street that you can check out and get some amazing photos! 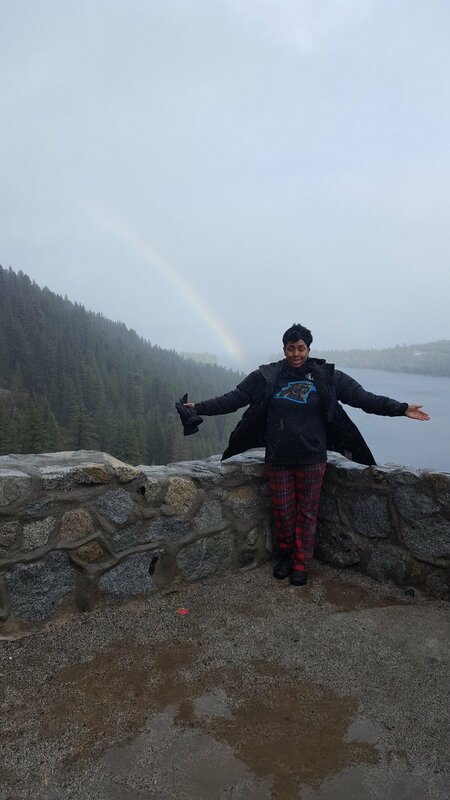 Ms. Kira Pearl having a good time posing with the gorgeous Mountains! 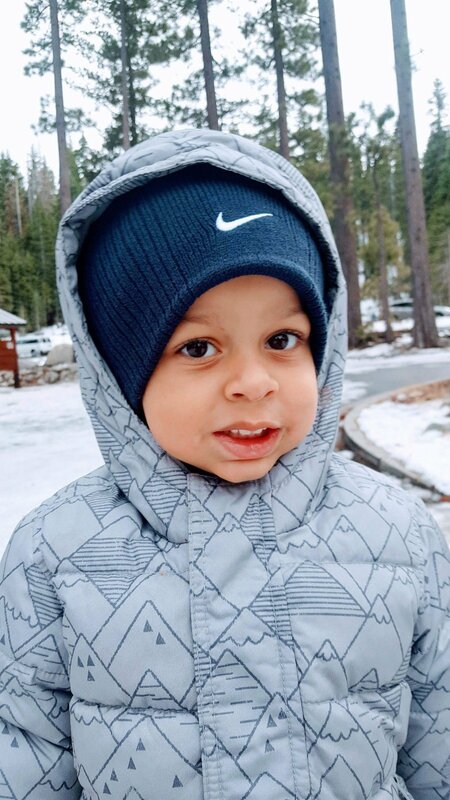 My son Keian cheesing for the camera! 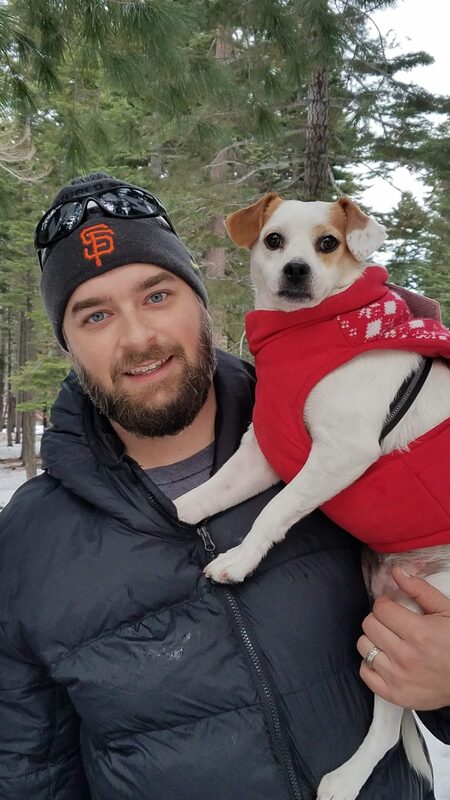 My gorgeous husband posing with out amazing pup, Ms. Dina!!! Now when I am jonesing for a good burger, I don’t need all the frills and expensive toppings. That is where people get it allll wrong. The amazing owner! He was the sweetest man! 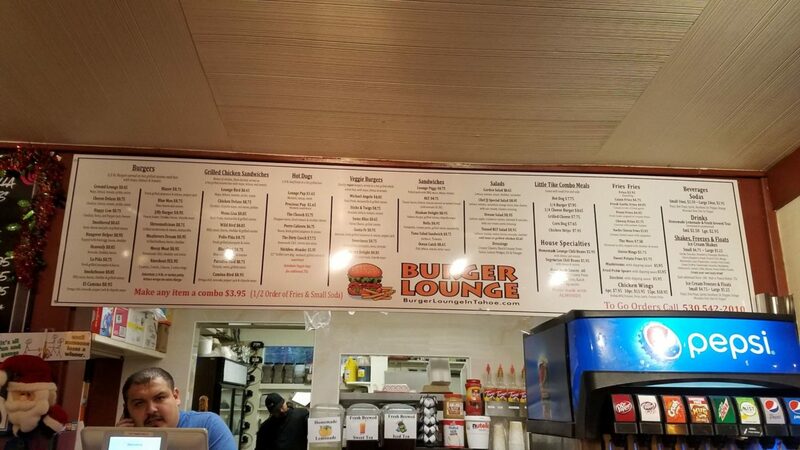 Their menu has everything….even options for you veggie lovers! If the meat and bun are top notch, then I am a happy girl. 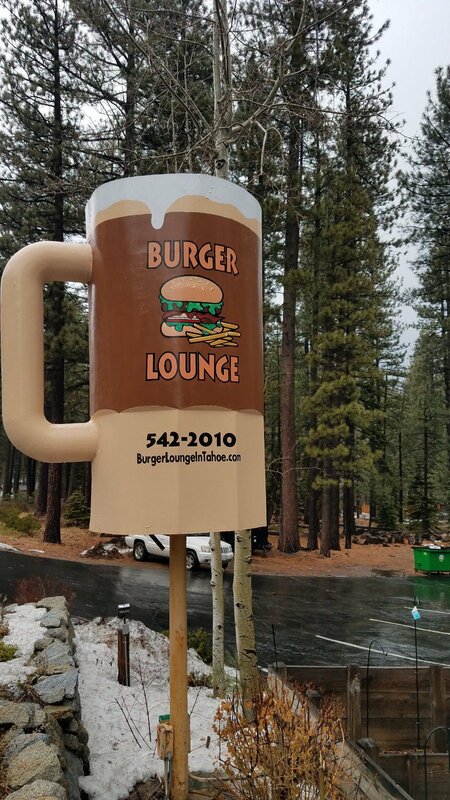 Down the road from the hotel is The Burger Lounge, a small local owned business that puts out killers burgers. Sorry for the blurry shot……but it was TOO good to not post! The best part is how affordable they are!! I ordered their Cheese Deluxe which was a whopping $8.75. 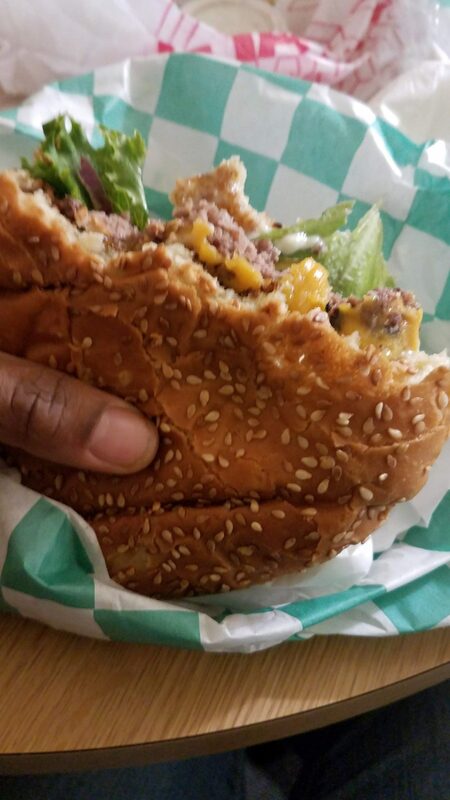 It came with cheddar, lettuce, tomato, pickles and onions. We ordered 2 of those and added friends for $4.00. We were beyond satisfied and I recommend stopping by on your way into town! The place is small and quaint with amazing owners!!! You will not be disappointed!! 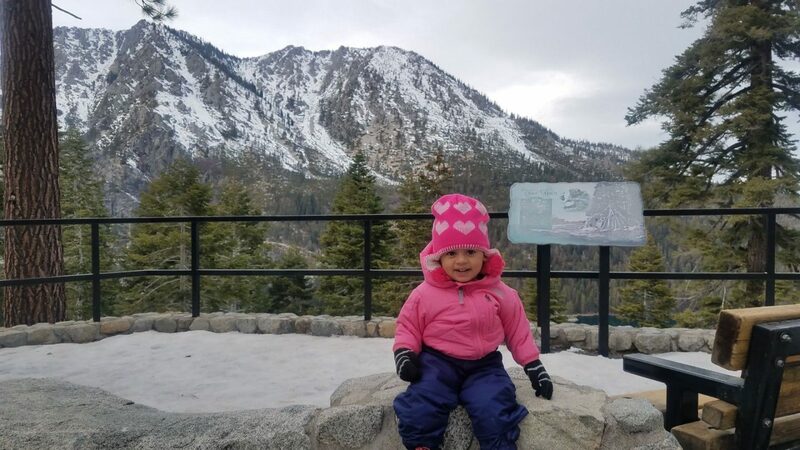 The best part of being in Tahoe during the winter are all the gorgeous photos that you get to take from the various Vista Points that are on either side of the lake!!! 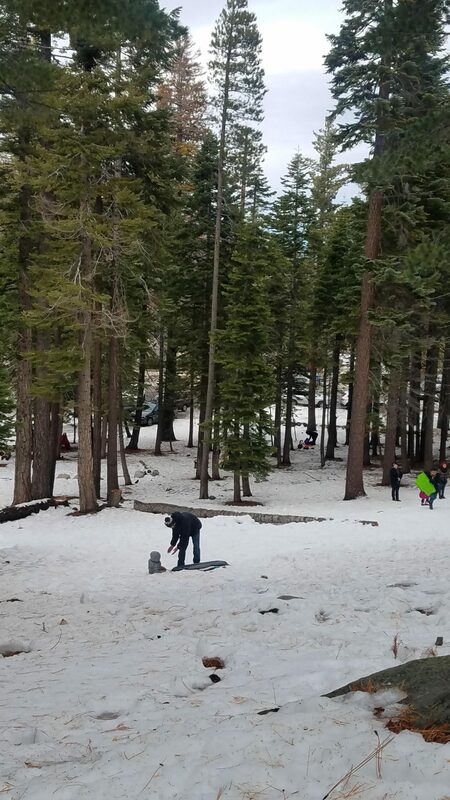 Emerald Bay Vista Point is my favorite!! Ahh….beer. My second love to food!!! 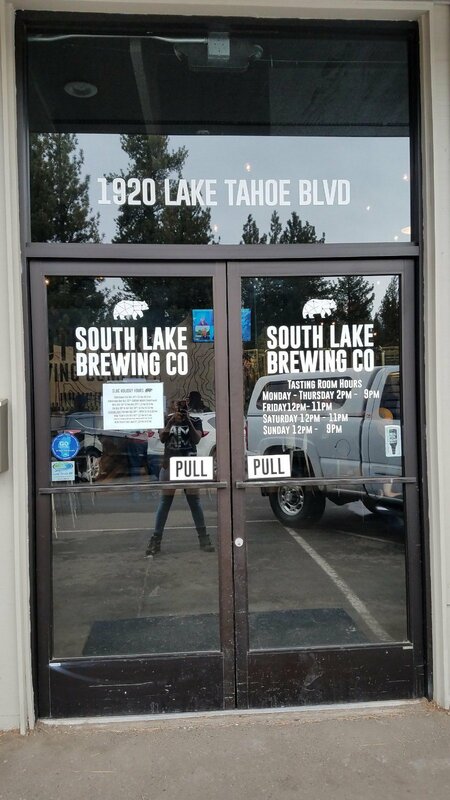 Now Tahoe has plenty of breweries around the area but this place is my favorite. 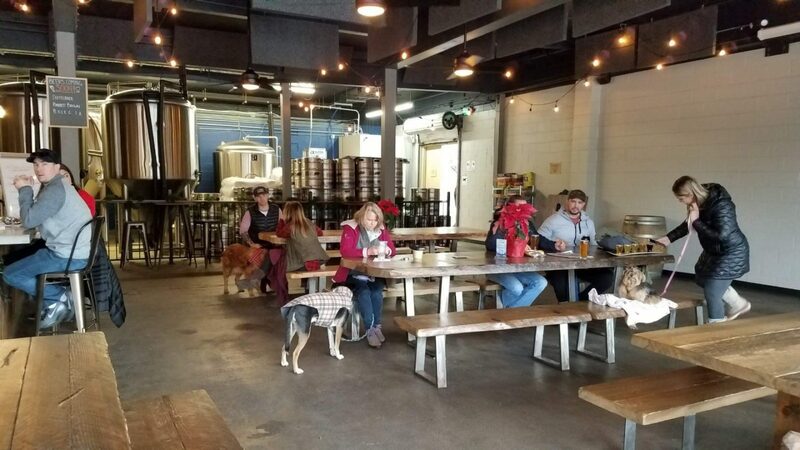 They are pet and kid friendly with amazing porters, stouts, IPA’s and ales for your liking. The best part is that they have a crowler machine so you can take a 32oz beer to go!! 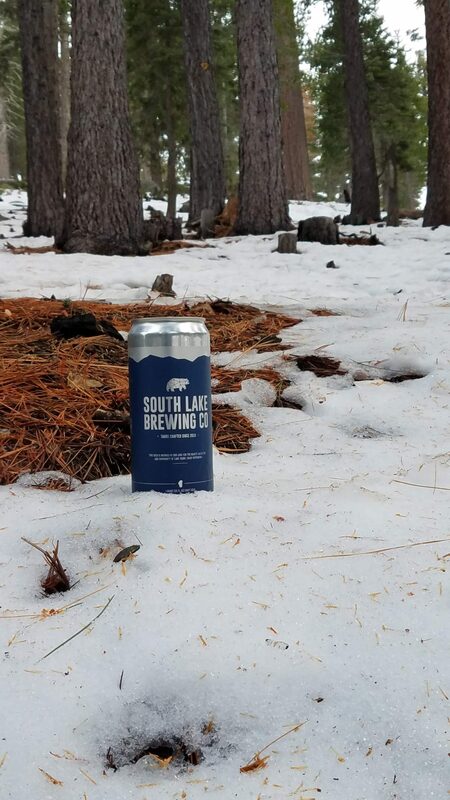 They have amazing prices too….averaging around $10 a crowler is a steal! Super friendly and knowledgeable staff!! 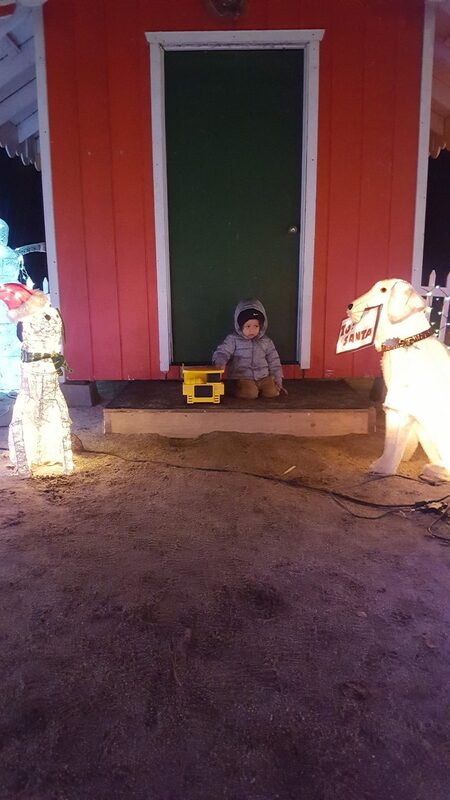 Pet AND kid friendly? I am SOLD!! 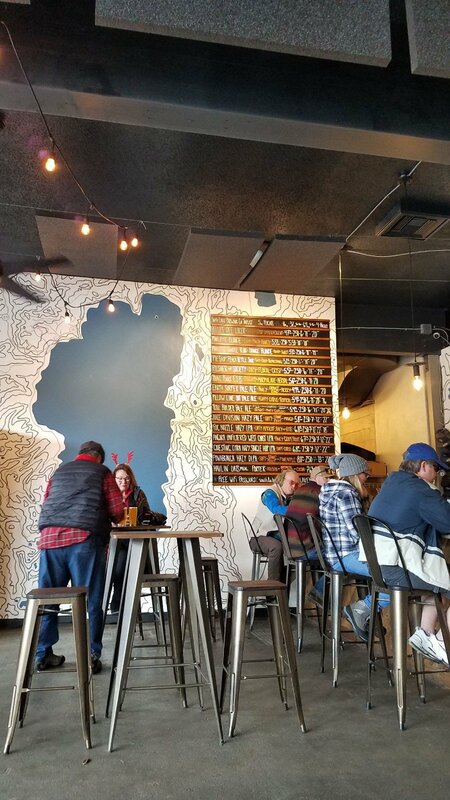 Make sure you take the time to visit and get yourself some beer while you are here or grab a few crowlers to take with you home!!! You wont regret it! After having a long day of venturing out and having a good time, we decided to venture back to the hotel for some quiet and fun with the kids. 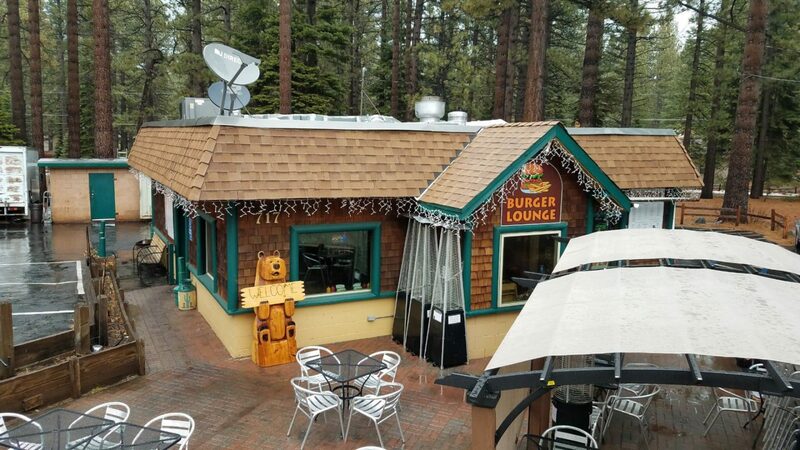 At night, the restaurant Sidelines Sports Pub puts out hot chocolate along with whipped cream and marshmallows. They also provide yummy little graham cracker packages for the kids to make smores too!! If you are hungry, there is Sidelines and The Boathouse on the Pier where you can order food without having to leave the premises. 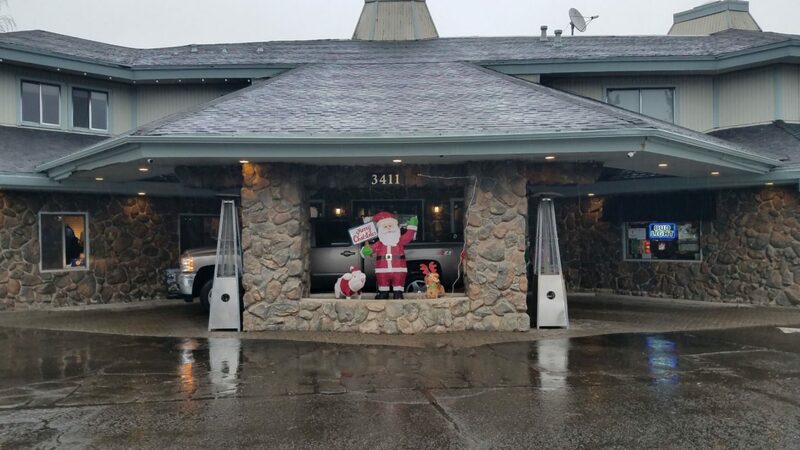 I hope that when you get the opportunity to visit Tahoe you will check out The Beach Retreat and Lodge for all your hotel needs. 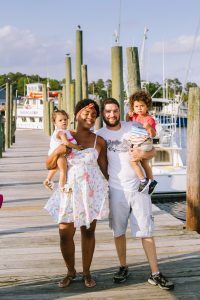 They are right on the water, have an amazing staff, food is on the premises and I have never had a bad experience in all the 5 years I have visited. I hope you enjoyed the article and please leave me any questions or comments you may have!!! Once again, thank you so much to The Beach Retreat for sponsoring our final stay. We truly appreciate the hospitality and your humble staff! Great read! The lodge sounds like a nice weekend getaway! And you had me at bacon donuts, burgers and BEER!!! I knew I liked you for a reason!